Yesterday I asked you how you pictured the characters in Suzanne Collins' bestselling novel THE HUNGER GAMES. Well, here's what I gleaned about race, culture, and class in this enthralling story. Early on we're informed that families in the Seam who work the mines have olive skin, dark hair, and gray eyes. Notice that their eyes aren't brown, which means they aren't Middle Eastern, Hispanic, or South Asian. Right after that sentence, Collins writes that Katniss' mother and Prim have light hair and blue eyes, physical characteristics that are out of place next to the mine workers in the Seam. She tells us that Katniss' maternal grandparents were part of a small merchant class of pharmacists. Katniss' parents, then, crossed some borders to marry. Peeta, too, is blond, and is part of a clan of bakers, definitely more prosperous than the mining families. We start to see a connection between race, class, and occupation. Is this a society organized along the lines of India's ancient caste system? 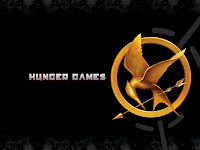 Hunger Games contestants Rue, with her "bright, dark eyes and satiny brown skin," and Thresh, also dark-skinned, are from District 11. This is the place where crops are grown for all of Panem. The community is impoverished, they're whipped if they disobey, love music, and send Katniss a gift of baked bread. Also, when you're writing a dystopian novel, what do you do with our global diversity of languages? Collins, who has some international experience herself, didn't write different dialect or jargon for each character, so I assume everybody in Panem speaks the same language in the same way. I appreciate how smoothly Collins included and described different races, but wonder if she was purposeful about the interesting connections between physical appearance (i.e., race), occupation, and class in her story. Did her conscious mind invent those classifications or was her unconscious mind in charge? I trust the movie makers at Lionsgate will cast the movie carefully. Will they pick actors with a range of accents? Will they represent the same distinctions between race and class as in the novel? If not, why not? It's going to be fascinating to watch them decide, especially as Collins herself is adapting the book into a screenplay. Oh, and if producer Nina Jacobson needs a consultant, tell her I'm available to fly from Boston to Hollywood, will you? Especially in the dead of winter.